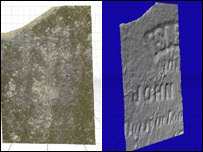 Illegible words on church headstones could be read once more thanks to a scan technology developed in the US. Scientists at Carnegie Mellon university are making high resolution 3D scans of tombstones to reveal the carved patterns in the stone. A computer matches the patterns to a database of signature carvings which reveals the words. The technique could one day also be used by doctors to examine a patient's tongue for signs of illness. Scientists often find it difficult to distinguish between natural phenomena and man-made art works carved into stone, due to the build-up of algae and surface dirt. At the moment, archaeologists are forced to do hand-tracing work with plastic sheets and to examine objects first hand in order to decipher obscured writings. And sometimes, it is just impossible to read what lies beneath the dirt. The new scanning method detects carved figures such as writings and drawings through 3D scans and computer analysis. "This technology is expected to reduce guessing work in field inspection," said Dr Yang Cai, director of the Ambient Intelligence Lab at Carnegie Mellon Cylab. In recent weeks, Dr Cai's research team have been testing the new technique at a 200-year-old cemetery close to the university in Pittsburgh. The scientists have been scanning unreadable gravestones at Old St Luke's Church to help its Episcopal pastor identify all the names on the cemetery's tombstones. The technology has been built on top of existing 3D reconstruction techniques. But the team at Carnegie Mellon is focusing on surface signatures. "We have designed special filters of 3D data that can detect curvature or linear features on a surface," Dr Cai said. The scientists scan the important areas in very high resolution and the rest in lower resolution, in order to avoid unmanageable digital file sizes. "This is similar to the human visual experience - we usually see the gazed area in high resolution but the peripheral area in a blurred vision," Dr Cai said. The team is also developing "template matching methods" to detect particular patterns such as carved shapes. 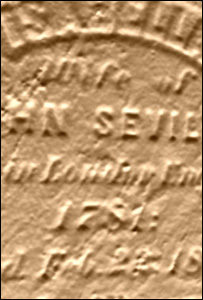 For example, tombstone carvings usually contain continuous lines for letters. The new technique allows them to define patterns of "typical" lines and curves and store them in a database. "If the computer finds the data matches the patterns in the database, then it will highlight the area," Dr Cai said. Experienced archaeologists have lots of accumulated pattern descriptions. For example, natural holes on the rock normally have rounded edges but man-made carvings in rock usually have rather sharp edges around the holes. This knowledge can be encoded thanks to the new technique. The database of 3D scan data can also be mapped onto other datasets, such as geographical information systems, historical weather databases and high-fidelity models of archaeological sites. In addition to discovering who is buried in the cemetery, Dr Cai's team is developing a digital cemetery for Old St. Luke's Church in order to help visualise the scanned data. It will be available for internet browsers, on DVD and interactive computer demos. The researchers believe the technology will also have practical applications in other industry sectors, such as the security and medical fields. Dr Cai said: "We may use the technology for the future UAVs (Unmanned Aviation vehicles) to detect ground signatures of ancient ruins and help medical doctors to diagnose patients' well-being through tongue inspection." The technology could also be used to predict a possible tsunami by examining the patterns on the surface of the world's oceans.